I just got an arcade in my basement. It's two floors of rooms, some themed to my favorite game makers, others made to look like a dungeon castle, a westen theme and even a room straight out of the 80s. The best part? It all fits neatly on my Xbox 360. 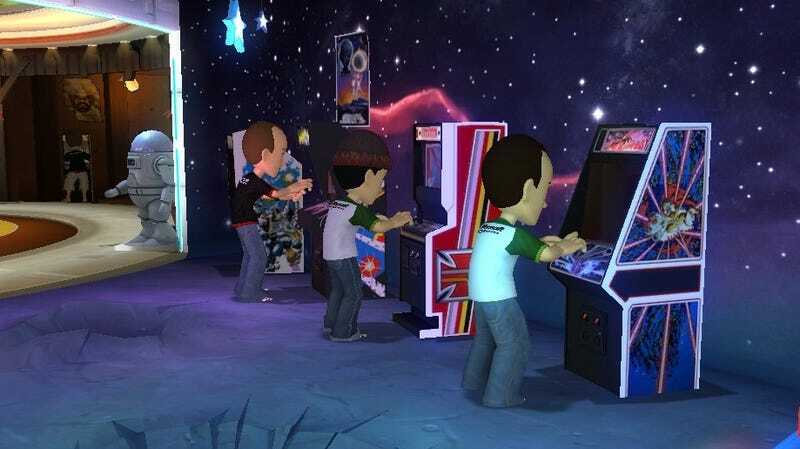 The Game Room launched in the middle of last week, delivering a free arcade to all Xbox 360 owners. But, as with the few remaining real world arcades, to play any of the games buzzing, blasting or plinking away in the mammoth virtual arcade you have to plunk down a quarter, actually two quarters, to play. In this case the quarters take the form of 40 purchased Microsoft Points automatically deducted from your account every time you want to try your hand at a game. Frank Pape, senior director at Microsoft Game Studios and one of the people behind the concept, said the decision to allow people to pay 50 cents to play a single game was more about trying to stay realistic than trying to cash in on the idea. "It's really about giving the community choice and we really wanted to stay true to the old arcades," he told Kotaku. "We wanted to give people the ability to play with two quarters, if you will – literally 50 cents or 40 Microsoft Points – and see how long they could last, just like in the old days. Of course, we also wanted to give people the option to purchase the games so we decided on the three 'tiers' of pricing – 240 Microsoft Points (about $2.50) to purchase a game on one platform, 400 Microsoft Points (about $5) to purchase on both Xbox 360 and Windows PC, and 40 Microsoft Points for single play." The Game Room launched with a "showcase" arcade and the ability to customize and create your own arcade. Once you drop into the Game Room you move the camera view around your arcade of choice to see the different floors of the arcade, shift between rooms and, finally, hop into a room to look at each game machine. A player can choose to hop onto a virtual machine to look at the rules or even play a free demo. Despite automatically filling the Game Room with your Xbox 360 3D avatar and some of the avatars representing the friends on your console's friend list, you can't actually control these virtual people. While I like the idea of a virtual arcade, it is a bit disappointing to not be able to virtually get in there and walk around, or invite your friends into the arcade to hang out and chat. And Microsoft's console can do that. For instance, friends using the NetFlix streaming service on the console can hang out on a virtual couch in avatar form and chat with one another while watching a movie together. Pape said Microsoft Game Studios is always open to ideas, but that they're "confident people will be really happy with the level of interaction they can have with their friends' Avatars in "Game Room" today." That includes inviting friends to your arcade to check out and play your game collection and those computer-driven avatars. But that's like decorating your home with pictures of your friends, instead of actually having them over. Hopefully, Microsoft Game Studios will get that and implement this seemingly obvious design change. If you're not too bummed about being limited to camera controls, and not avatar controls, in the Game Room, you can always create your own arcade. When you do this you only have access to the machines you purchased, but you also can make use of a variety of free themes and props to spruce up the place. If you're really into the idea, you can also purchase special props or even mascots that will walk around your arcade. The mascots are a neat edition to a concept that has very few flaws. OK, the one glaring flaw. Many of the games playable in the arcade also have mascots. I was wowed by some of the design decisions that went into them. For instance, classic Atari game Adventure, which features graphics that are so blocky they make the game's key dragon look like a duck, has a moving mascot that looks just like a life-sized, pixelated yellow duck. That's a purchase hard to resist for any fan of retro games who plans to spend time in their arcade. Pape said the idea for the mascots came to him when he was thinking about ways to increase what he calls the "chaos and frenetic energy" of the arcade. "I wanted to simultaneously bring more life to 'Game Room' (the digital arcade of 2010 and beyond) and give a shout out to the classic gaming icons of yesteryear," Pape said. "I had a feeling that the licensors would get a kick out of it and that consumers would too. Fortunately, that has turned out to be the case, as my core production team initially thought I had gone off the deep end. They have since recovered and are all mascot believers now. The mascots are 2-D extruded sprites which gives them the cool, retro look and they were created by Jason Renfroe and his crack art team at MGS." Another way the design team at Microsoft Game Studios and Krome managed to replicate the energy of walking into an arcade is with sound. Each machine located in the Game Room contributes its specific gameplay and music to what becomes a very familiar cacophony to anyone who has ever stepped foot in an arcade. And instead of just recording a mash-up of generic arcade machines, Game Room's soundtrack is created by layering over all of the sounds of the machines in your arcade to create something unique and special. Another way the two teams stayed faithful to the spirit of retro arcades was by making sure they faithfully replicated the games themselves. Currently, the Game Room launched with 30 original arcade and console games from Atari, Intellivision and Konami. Microsoft plans to release more titles for the virtual arcade every week. To get a game into the Game Room, Microsoft first has to convince the publishers or owners of the title that it's a good idea for them. Something that wasn't always easy. "In some instances, they instantly embraced it; in others, particularly those licensors/publishers that already make a healthy living off of their nostalgic IP, we needed to impress upon them how revolutionary combining the power of LIVE and the design of "Game Room" with their IP could be," Pape said. "Ultimately, we succeeded and have signed with some of the best partners possible." Once a game is OKed for the Game Room, the team tries to get the original game code and cabinet art from the publishers. When that isn't possible, they turn to Australian game developers Krome who recreated "spot-on emulation and artwork" for the service, Pape said. Game Room has run into reluctance among some gamers, particularly those who don't like the idea of having to repurchase a title they already own on the console just to access it in the Game Room. Xbox 360&apos;s Game Room Wants You to Rebuy Your "Arcade"
Pape points out that the Game Room includes a new environment, a new way for gamers to issue challenges to each other in a game and more Xbox 360 Achievements. For Pape and his team, the Game Room is almost more about the experience, the feel of being in an arcade, than it is about the games themselves. In fact, that's how the idea for Game Room came about in 2008. "I love classic arcade and console games," Pape said. "The concept for 'Game Room' was born during a meeting with myself and Xbox LIVE general manager Marc Whitten, in which were talking about ways to emulate retro games for the living room." While the experience may have some flaws, drifting through the arcade with the help of an Xbox 360 controller does bring back fond memories for a gamer born in the 70s: Games lined up against the walls on garish carpeting. Recognizing bits of noise amidst the wall of sound that greets you when you step into the building. Seeing the computer-controlled cartoonish version of my brother walking up to the white, blue and purple cabinet of Atari's 1983 classic Crystal Castles to play a game. Arcades hold a very special place in my heart. With a few minor tweaks, these types of virtual experiences could be the future of arcade gaming, at least in the United States where the arcade is quickly fading away. They just need to come up with a special controller to help replicate the feel of gaming in an arcade, something that insures that, sadly, the bump-and-grind play of pinballs will never successfully get this treatment.